The Train is called TRAM for “Tramvia” or like we would call it a Streetcar train. Additionally it is important to know if you are arriving at Alicante airport, that there is no train station for this or any other train at the Airport of Alicante! (As of today June 2011 ) – they had planned one some time ago, but they never got there planning right – so do not look for one. 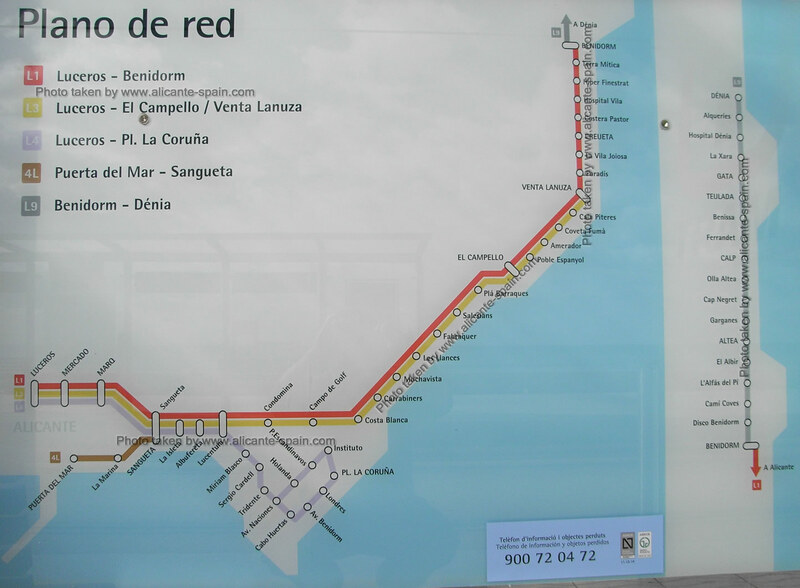 You can use the narrow gauge railway to Benidorm and Denia also for your trip to Altea, Calpe and Teulada. The easiest way is to take the Tram at the FGV Tram streetcar station at Plaza Puerta del Mar, located in the beautiful harbor area of Alicante. From the airport in Alicante you can easily and directly go there using the C6 Alicante airport bus. At the end of the bus ride (after about 45 minutes) is the bus stop Puerta de Mar. It is the last bus stop – the bus driver will wake you up anyway if you fall asleep as I usually do on those kind of buses. Your Trip would look like this: Alicante Airport -> Airport Bus C6 to Alicante Streetcar Station “Puerta del Mar” -> Take Alicante Streetcar TRAM to Benidorm, Altea, Calpe, Benissa, Teulada, Gata or Denia. 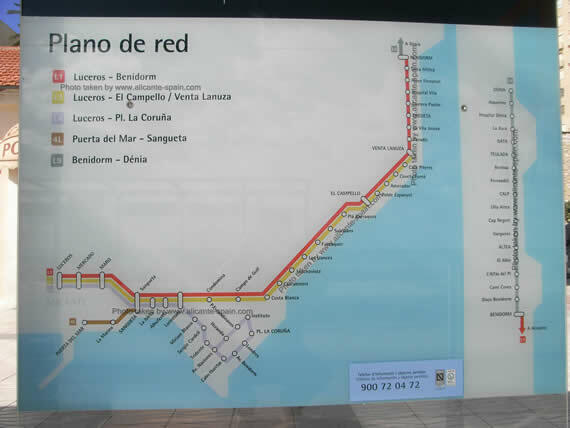 As you can see on the detailed route map to Denia Benidorm and Calpe (just click on the map) , the Tram stops in many cities, town and villages along the coastline. Does it sound like a long journey? First you might need a Tram Ticket for Zone A downtown Alicante, which is EUR 1,15 . In addition you will need an FGV train ticket, depending which zone are you going. Getting To Benidorm or other cities around the Costa Blanca by TRAM, is a wonderful way to enjoy the beautiful landscape along the coast. Since the train stops at very many towns and cities on its way north, travelling by TRAM takes its time. For a simple “airport to hotel” transfer, I would advice against it and instead use direct bus services from Alicante airport where possible.